Home - What is CPR - Can you get sick by performing CPR? It’s clear that CPR is an effective part of the emergency response to cardiopulmonary arrest, one that could potentially save thousands of lives a year. Yet, in most cases, victims aren’t getting this lifesaving treatment, even when bystanders are familiar with CPR. It turns out that a large number of people are afraid of contracting some nasty disease during mouth-to-mouth resuscitation to strangers. This fear was heightened by the emergence of deadly infectious diseases, such as HIV, that are spread by bodily fluids. Even though there have been no documented cases of anyone ever catching HIV during CPR, there is still a chance, however tiny, of this happening. Hepatitis C may be a bigger threat as most people who carry this incurable disease may not even be aware that they have it. Gloves – Gloves prevent contact with saliva (if you have to reach in their mouth) and blood (if the victim has cuts or abrasions). The most popular types are latex and nitrile. Nitrile are preferred because there are people who have severe latex allergies. Safety Glasses – Safety glasses are going to protect your eyes from blood, vomit, or any other bodily fluid. If you are an EMT make it a habit to always wear them. 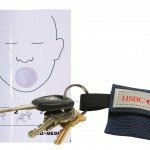 CPR Barrier Devices – CPR barrier devices are the most important piece of equipment that you can use to protect yourself from disease. Many times a person will have blood or vomit in their mouth and you will be happy that you have a barrier device. 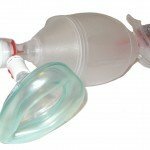 Bag valve mask is a mask that is placed over an unconscious person’s face that is attached to a bag. The bag is squeezed and the air in the bag is pushed into the patient’s lungs. The bag can also be hooked up to oxygen, making it the safest and most effective way to deliver breaths during CPR. 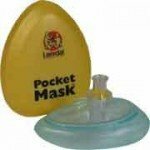 Pocket masks are not as effective as the BVM, but they are portable. The masks are placed over the patient’s face and they have a one way valve so that air can pass through to the patient’s lungs, but “goo” cannot come back through the mask to your mouth. Keychain masks are the most portable CPR barrier devices available. They consist of a one way valve fixed into the center of a piece of plastic. The plastic will fit over the patient’s face; some masks will fit around the ears as well. These measures need you to carry your CPR kit with you everywhere. Most people don’t plan when they go into cardiopulmonary arrest, so you never know where you might need your gear. This article is not meant to make you fearful of providing CPR without the kit in an emergency. When unsure or fearful of contracting something bad while performing CPR, especially on a stranger, remember you don’t have to give mouth-to-mouth resuscitation for CPR to be effective. Hands only CPR is better than not doing anything at all.